If you’re being treated for a heart condition, medicine cabinet staples such as aspirin and ibuprofen may not be good for you. The same goes for certain antibiotics. 1. Aspirin. If you’re on blood thinners, beware of aspirin. Aspirin combined with antiplatelet drugs (such as clopidogrel [Plavix®]) and anticoagulants (such as warfarin [Coumadin®]) increases your risk of bleeding, showed a study called the WOEST trial. While all three medicines help prevent blood clots, taking them at the same time can be too much of a good thing. 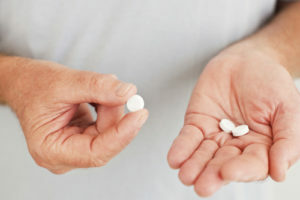 In the WOEST trial, which studied angioplasty patients, researchers compared those who took anticoagulants and antiplatelet drugs with aspirin and those who took them without aspirin. Patients who took aspirin were more likely to need blood transfusions. If you take blood thinners, talk with your doctor before taking aspirin as well. 2. NSAID pain relievers, such as naproxen and ibuprofen. If you have atrial fibrillation (irregular heartbeat) and are on blood thinners to lower your risk of blood clots and stroke, beware of nonsteroidal anti-inflammatory drugs (NSAIDs). NSAIDs include common pain relievers naproxen (Aleve®) and ibuprofen (Advil®). One Danish study recently reported the link between NSAIDs and bleeding and clotting but did not determine if NSAIDs were the direct cause. Until more studies can be done, ask your doctor about using NSAIDs for pain relief, even for brief periods. 3. Certain antibiotics. 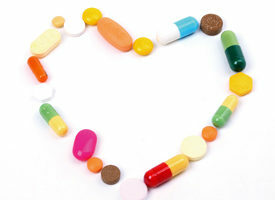 If you are at high risk for arrhythmia, beware of certain types of antibiotics. Some can disrupt the heart’s electrical activity and lead to a (sometimes lethal) rapid heartbeat. Azithromycin (Z-pak) is one popular antibiotic that multiple studies have linked to an increase in arrhythmia-related cardiovascular deaths. Levofloxacin has shown a similar risk. Amoxicillin and ciprofloxacin have shown lower risks.